Day 3 started with fitting the 3 risers we cut yesterday, they went in lovely and the base now sits perfectly. The 11mm OSB was a bit flexible on the top so we decided to fit another layer which firmed it up a bit, this with a decent wooden floor from the Recycling project should be nice and stable. We wont fix these in place until we have all the walls ready. By the end of Sunday we had 1 sidewall, and the dividing wall that will separate the office from the store room. Not a bad start for the first weekend of the build. Used a thicker board on the top level for the flooring so it had less flex. 4 Comments on "Day 3"
Rather than laying a new concrete base you could have built small pillars out of brick and made sure the tops of them were level. Then your frame could have sat directly on them (with a bit of DPM in between ). I’m building a very sililar shed. The concrete base is going down on Friday so almost ready to start the fun bit after a couple of weeke of digging. How are you roofing and cladding the shed? I’m looking at EPDM rubber for the roof and the walls being build in a CLS >> Breather membrane >> 20mm Batton >> Larch Cladding sandwich. Always good to see another fellow shed builder doing it for themselves. 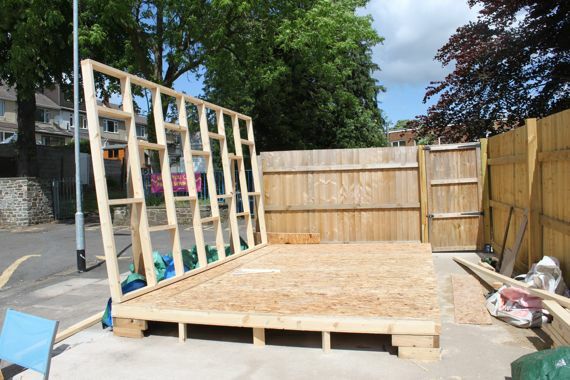 Hi Simon, I’m looking at taking a similar route, from the inside my walls will go: 11mm OSB >> Stud wall (I used 100x50mm which I will fill with 90mm Rockwool Flexi insulation slab) >> breather membrane >> Battons >>final cladding (still not decided on what to use yet). 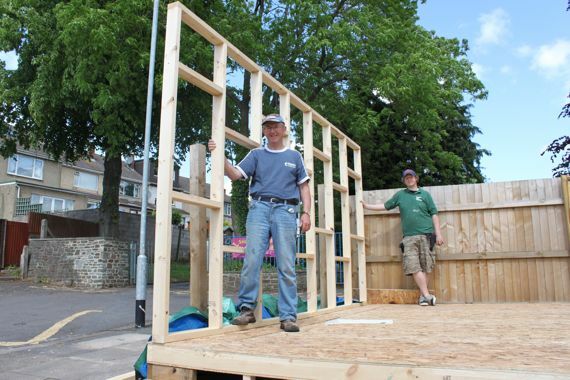 For the roof I will use a similar structure and insulate it with some more rock wool I have left over from my loft – I would like to use the EPDM but am unsure of costs – have you seen any prices on line, and is it something you can fit yourself? I bought a 5 X 3 metre firestone epdm sheet for £90 online. I think it should be easy to fit with the waterbased adhesive which is about another £20 from memory. Perhaps a tad more expensive than felt but no chance of leaking. There’s a few videos online showing how to fit. Sounds like we have a very similar design. The cladding took me 3 months to find but there was a guy selling larch on ebay and I couldn’t turn it down.